Imbibers and diners venturing into Bannister Street’s revamped Joxer Daly’s (now known as the Craft Beer Kitchen) will likely notice a large wall hanging featuring a bevy of bountiful, boater-hatted, bow-tied butchers. Actually I’ve used a bit of artistic license here, remove the bevy and the bountiful; there are only two butchers, but I love alliteration. One of the above is Dan Simonsen; the other shall remain nameless for the sake of decorum, anonymity and good taste. The photo was taken in 1967. 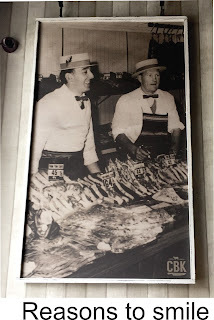 Eyes might be sensibly averted to the mouth-watering prices on the meat displayed on the counter in front of the two journeymen. Porterhouse steak is a mere 64 cents a pound. Decimal currency was just in, but we still sold goods in pounds rather than kilos. Converted, porterhouse would have been at $1.40 a kilo. I checked in at my favourite supermarket last week and saw that porterhouse steak is now $35.99 a kilo, so it has increased 26 fold in 50 years. Well, you’re thinking, so what? When inflation is taken into account, and we’ve certainly had plenty of that over the intervening period, prices naturally go up. Well my research via google showed that the average weekly wage was $50 in 1967; today it’s more like a thousand dollars, so that’s a 20 fold increase. If we multiply the 1967 price by the wage increase we get $28.00 a kilo as opposed to $35.99; so steak may be steadily pricing itself off the market. Strangely enough, the price of beef in the paddock hasn’t increased to anything like that extent, obviously attendant costs have. If we did the same exercise with lamb the discrepancy is even greater. In the full-sized original photo, lamb loin chops are shown at 33 cents a pound; that’s 73 cents a kilo. Today’s supermarket price: $26.99 a kilo. In this instance the multiplication is times 37. But the real disparity lies in housing. We built our first home in 1963. We borrowed 2500 pounds off the government-owned State Advances Corporation at an interest rate of 5%. I was being paid 20 pounds ($40) a week at the time and had my wage had been just below that level the interest rate would have been 3%. You could build a modest three-bedroomed home for 2500 pounds back then, no garage or garden shed; they came later. If you proved you owned the section freehold (average price 150 pounds) State Advances would willingly lend you the money. These solidly built houses are well entrenched in this town and have all stood the test of time. Repayments for the 25 year loan weren’t too much of a burden and with ongoing inflation, sometimes rampant, became even less so. Meanwhile the incoming Labour government has promised to build a tens of thousands of ‘affordable dwellings’ for first home buyers and suggest they will be priced at somewhere between five and six hundred thousand dollars. My generations first homes cost us at most $6000 - multiply that by the 20 fold wage increases and you get $120,000. So somewhere in the mix today’s young couples have lost around four hundred and eighty thousand dollars. 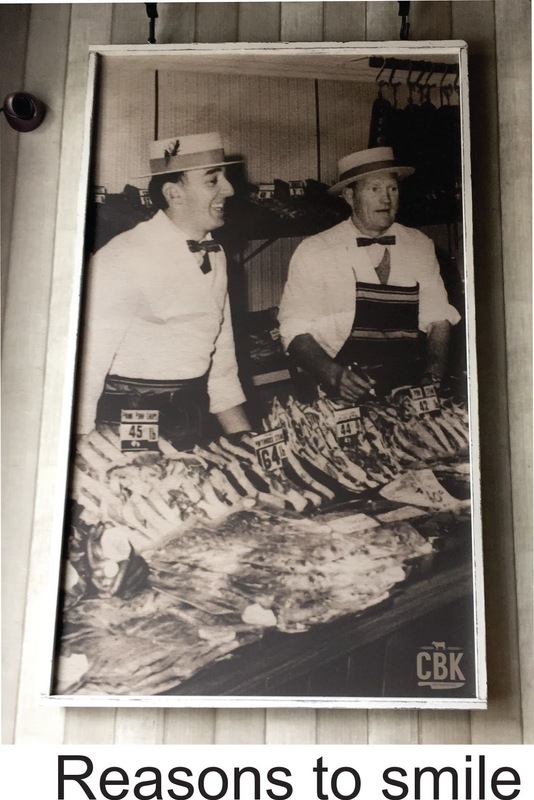 The two butchers in the photo at CBK are smiling. And so they should be; they lived in the best of times.